Kabakov worked as a children’s book illustrator to make his work as an artist. Born in 1933, he was 50 years old when the Western artmarket fell in love with his work. He began to work with Emilia, his new wife, who is a trained concert pianist, in 1988. When I became aware of the Kabakov’s work in the early 1990’s, I was already of the mind that the Russian film director Andre Tarkosfky was the most visionary filmmaker of the age. It was after being mesmerized by seeing the film Solaris based on a short story by Stanislav Lem, which caused this reaction in my psyche. Even after studying cinema history, Solaris was for me the one film which penetrated the depths of human consciousness and desires in a way like no other did in the theater of science fiction fantasy that questioned every hair on the head of his characters. Solaris showed how every person’s world is composed of unfulfilled desires and a contest between those desires and the requirements of the larger rational, scientifically constructed world, that itself is a projection generated by state control of the mind. 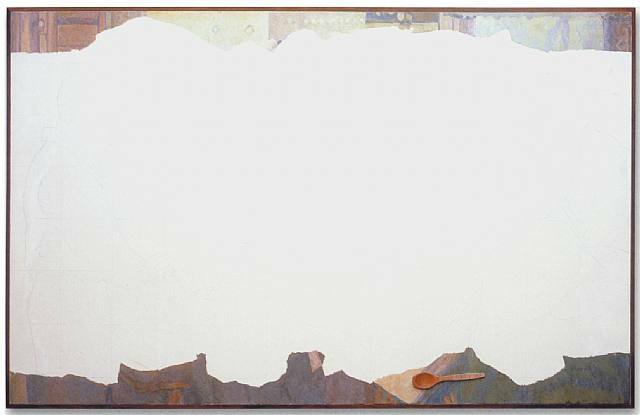 “Ilya Kabakov occupied an ambiguous position in Soviet society: he created “unofficial” art, yet by 1965, he had become a full member of the powerful Union of Soviet Artists. Without the approval of the Union, one had no legal right to be an artist. Here it seems that Kabakov is saying that he was not a conflicted artist who was torn between his beliefs and his duties to the state. Yet then why does Kabakov make such pronounced commentary in his work about the failure of the Soviet empire? Especially when he was personally befitting from having a good state sanctioned position as a creative talent, whom himself had a real role in perpetuating the imaginary reality that the powers that be desired to project into the subconsciousness of the citizens at every level of the society. 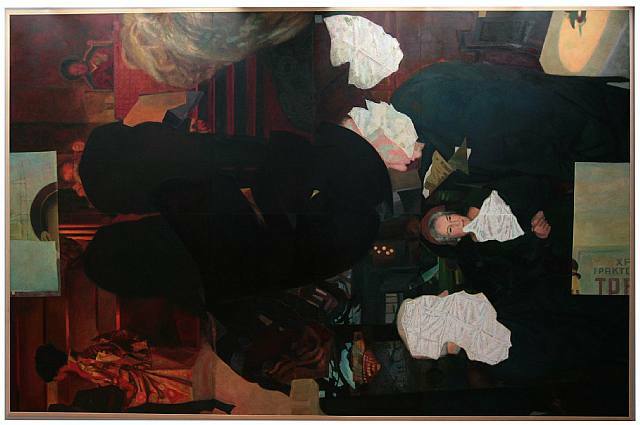 In this work by Kabakov, a comparison can be made between the central character in Solaris, a Soviet scientist, Kelvin, who realizes he is being trapped by his desires on the planet Solaris, where he was sent to investigate the previous crew having gone mad. In Kabakov’s The Man Who Flew into space, it is evident that the man went insane in his apartment, constructed a gigantic slingshot, and hurled himself against the ceiling, creating a gigantic hole in the roof of his building. His fate can only be guessed at, see no blood, but it is likely that he has met his demise in realizing his fantasy. 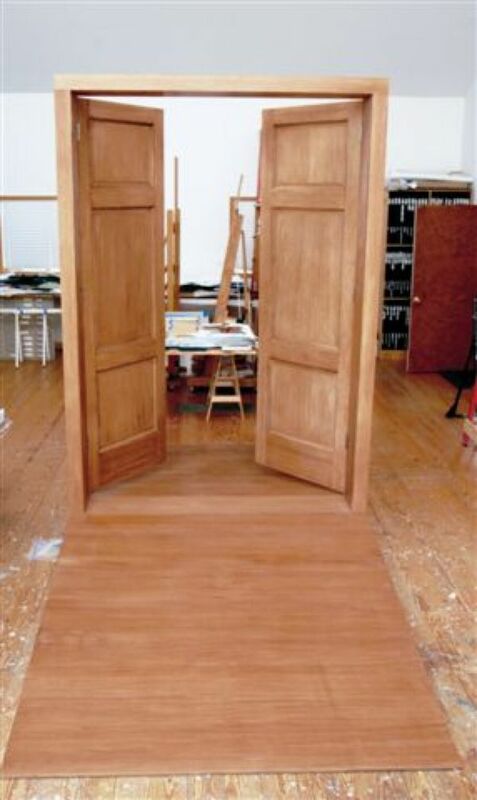 “Ilya Kabakov, The Toilet, 1992. Stone, cement, wood, paint construction, men’s room, women’s room, household objects, furniture, Overall h. approx. 450 cm, w. 417cm, l. 1100cm. Installation, Documenta IX, Kassel, Germany. 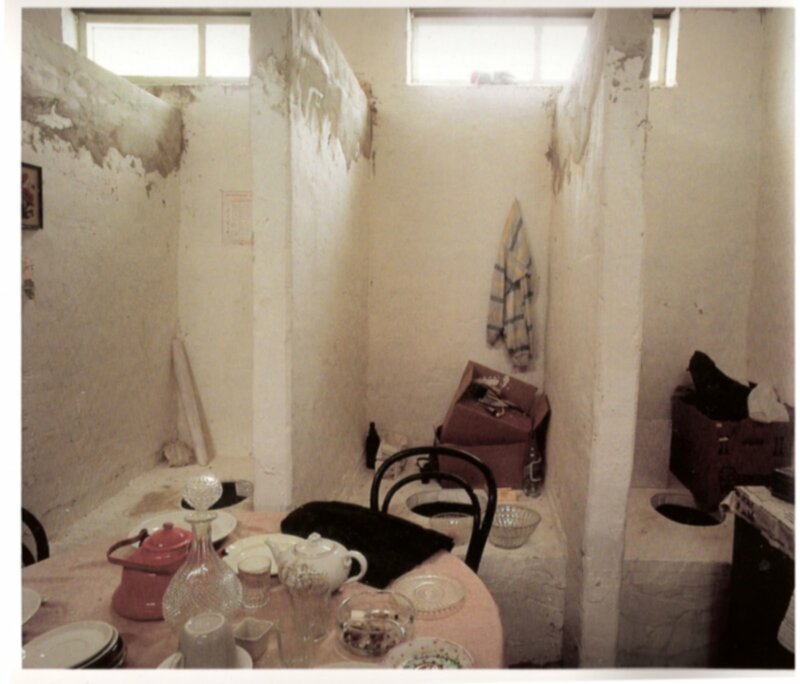 Image courtesy of Ilya and Emilia Kabakov.” For me this work also shares an affinity with Tarkofsky’s film Solaris, in that the space ship Kelvin is on is functional but decrepit, just like Kabakov’s Toilet as apartment. Here representation of the real becomes the fantastic and unbelieveable. In 1995 I was able to see Kabakov’s work at an exhibition for the first time, at the Rosamund Felsen gallery at Bergamot Station in Santa Monica, California, which was then the hottest new gallery cluster in Los Angeles. Kabakov created a series of framed paintings, where he then smashed the glass in the frames, to make it seems as if an insurrection had just happened that was a direct assault on the Social Realist style works. On the floor was a huge painting of clouds. This caused the room to seem to be upside down. There was also a lengthy phenomenally engaging fantastic text that one could read or not, but which enlivened the show into another dimension of engagement entirely. I recall seen feeling that this was one of the most powerful installations I had ever seen. I was especially impressed in that Kabakov had found the means to critque certain ways of being in the world by using both painting, found objects, and fabricated sculptures. I also saw the Kabakov’s work (the Empty Museum) at PS1 in Queens, and in Marfa, in 2007. The latter being an installation that mimicked a Russian grade school. I have to ask here now – just what would Kabakov have to say about the cultural condition in the United States today? What does he think of America and the art being made in this country? What would he say to hearing that many, many American artists feel about America the way he does about Russia? I’ve also considered the otherworldly reception of Kabakov by the American art world audience. It is as if he is being rewarded for telling the tales of just how horrible Russia is, to the delight of many Americans who like myself remember watching television in the 1960’s, of Russians standing in bread lines, of them going to stores with bare selves. Yet just a week ago I was in Northern California, in Berkeley, where were able to purchase chef grade food items, whose variety alone made us feel as if Los Angeles, where we live, is a third world country in terms of its supermarkets as compared to Berkeley Bowl in Berkeley, California. 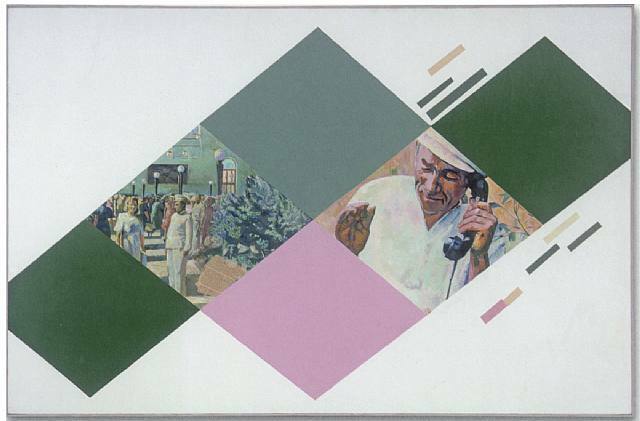 The Kabakov's Venice Biennale contribution: "Kabakov: The origins of Eastern European installations lie in painting. … The Western installation is oriented toward the object… Eastern installation is oriented toward space… toward the atmosphere of a particular situation." "Beuys and Kienholz are like a pump with a huge amount of energy - you feel the ghost. It's the world that occurs after death. For us, the installation is the provocation of the memory, people come, but don't look at the object. The effect of the installation is very spontaneous, people come to remember, an activation takes place, as in music." Despite these comments, it seems to me that Kabokov’s aim in this phenomenal work in Venice was not to stir one’s memory, but to cause in the mind a fantastic, dreamlike vision, whereby one directly experienced an art object as a form of astounding hallucination. This is of course using a lie to tell the truth, as Picasso would say. "Ilya & Emilia Kabakov - The Tennis Game (Conversation between Ilya Kabakov - Boris Groys) 1999-2001, installation mixed media, 1200 x 2000 cm, exhibition view"
All text for “The Tennis Game” is by GALLERIACONTINUA / Le Moulin, from their press release. becomes the scene of a re-transcribed verbal joust. 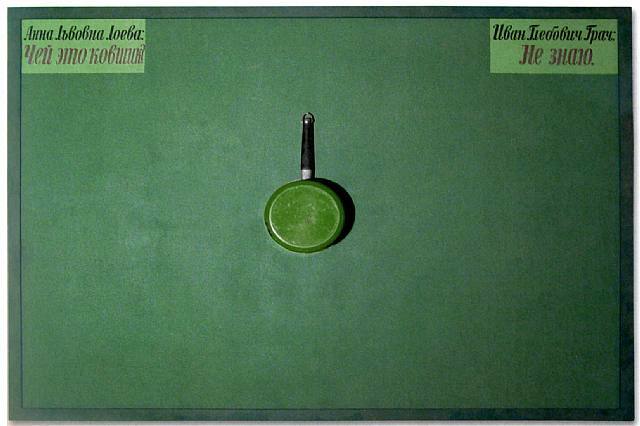 The match was played by Ilya Kabakov and Boris Groys. The spectators can watch past action on television screens. True, the players don’t have the same level as Boris Becker or Marat Safin, but the principal after all, is to love the game. At the same time, the spectators can contemplate the result of another game, written on the black painting. 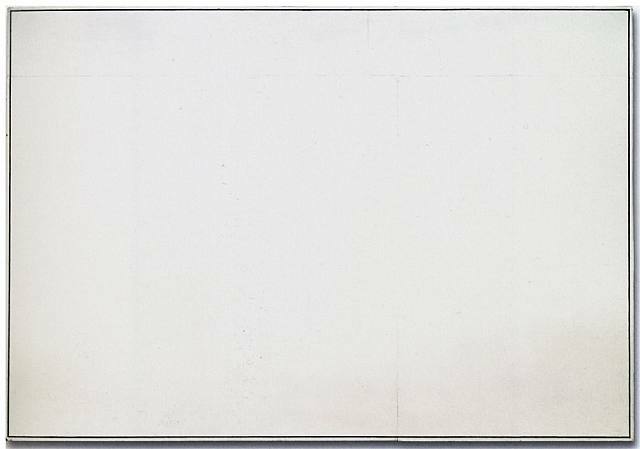 The dialogues between the philosopher Boris Groys and the artist Ilya Kabakov are presented like five rounds of a tennis match in which a question is served and then followed by a return shot. This text description of the tennis game as intellectual game reminds me of Alain Robe-Grillet’s cinematic masterpiece Last Year in Marienbad, where the film’s key actors play out a simple yet highly intellectually challenging game by removing toothpicks from a container. The person who takes the last toothpick is the looser of the game. This installation also seems to be something that the William Forsythe dance company in Germany would deploy for one of their astonishing experimental theater works. The Kabakov's Russian children's School, Chinati Foundation, Marfa, Texas, with a portrait of Lenin. This was one of the most touching yet haunting installations I've ever encountered. 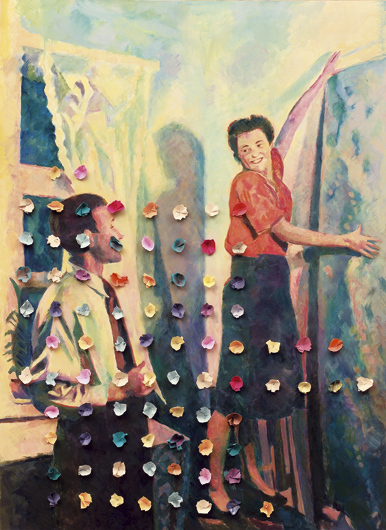 The Kabakov's alternative history project on painting - using the fictional character Charles Rosenberg to created 60 paintings that question the history of Modernist painting. Vincent Johnson lives and works in Los Angeles. His work has been exhibited at Soho House, Los Angeles, Palihouse, West Los Angeles, Las Cienegas Projects, LAXART, the P.S. 1. Museum, the SK Stiftung, Cologne, the Santa Monica Museum of Art, the Museum of Contemporary Art, Chicago, the Studio Museum in Harlem, the Adamski Gallery of Contemporary Art, Aachen, Locust Projects, Miami, the Sacramento Center for Contemporary Art, 18th Street Arts, Santa Monica and the Boston University Art Gallery. His photographic works engage both significant and neglected historical and contemporary cultural artifacts and is based on intensive research of his subjects. Upcoming are projects in Europe and Los Angeles. He will also be participating in at least one Los Angeles art fair this coming fall. Johnson received his MFA from Art Center College of Design in 1997 and his BFA from the School of the Art Institute of Chicago. He studied with Mike Kelly, Jack Goldstein, Stephen Prina, Liz Larner, Chris Williams, Mayo Thompson (formerly of Art&Language), and Liz Larner. He is a 2005 Creative Capital Grantee, and was nominated for the Baum: An Emerging American Photographer’s Award in 2004 and for the New Museum of Contemporary Arts Aldrich Art Award in 2007 and for the Art Matters grant in 2008, and in 2009 nominated for Foundation for Contemporary Art Fellowship, Los Angeles. In 2010 he was named a United States Artists project artist. His work has been reviewed in ArtForum, The New York Times and the Los Angeles Times, Art in America and many other publications. Vincent Johnson’s work is a form of sustained cultural mining that explores the depths of his subjects. His photographic works created from 2001-2007 delved into architecture as fantasy, from the vernacular architecture of Los Angeles to that found throughout the American West. He has documented several of the no longer extant commercial vernacular structures in both South Los Angeles and the San Fernando Valley that came into existence during the birth of long distance family travel by car. In 2007 he presented a fully fabricated work of sculpture – a 12 foot long six-foot high replica of a 1956 Chrysler Air Raid Siren. This project developed as he was both researching and documenting a former military corridor in the San Fernando Valley that included a retired military airfield. His more recent photographic works, all created in 2008 and 2009, are large-scale photographic montages, each of which consider significant cultural figures and several dramatic signal events of Cold War era Western cultural history, including Television, the launch of Sputnik, the Soviet Space program, American home-based bomb shelter program, and Vietnam. 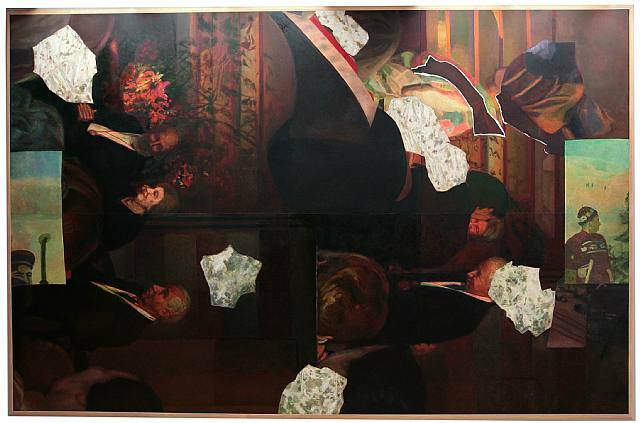 He is working on large-scale photomontages of the several major American political figures of 1960’s, including Martin Luther King, the Kennedy family, and Malcolm X, as well the representations of both Communism and Capitalism, Hollywood and Los Angeles and many related Cold War era subjects. Johnson’s photomontages can take several months to create as he captures hundreds of images from online sources, before selecting those which most well index a particular historical moment, personage or event. The creative juxtapositions and scale shifts of the found images is what he most relies on to develop his potent and illuminating photographic works.At to the end of 2010 he returned to his native city of Cleveland, to document some of its most distressed architecture. In 2011 he has returned to both photographically document Los Angeles and has expanded into Chicago. He is also in the process of creating a new body of abstract paintings based on his ideas about architecture.